Craving for desserts? 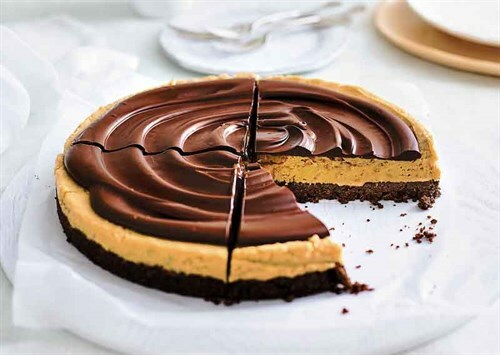 Check out this delicious recipe of peanut butter chocolate pie. Grease a 22cm springform pan. Melt 125g of the butter. Process biscuits in a food processor until fine crumbs, then stir in the melted butter. Press mixture into the base of prepared pan; refrigerate while preparing filling. Beat 100g of the butter (softened slightly), peanut butter and icing sugar mixture in a large bowl with an electric mixer until smooth and combined. Spread the mixture over the base and refrigerate. Chop the remaining 25g of butter. Place the butter and chocolate in a heatproof bowl over a pan of simmering water (do not allow base of bowl to touch water); stir until melted. Spread the chocolate over the peanut butter mixture. Refrigerate until ready to serve. We used a good-quality peanut butter that contains only peanuts and salt. If you use one that contains added oils, sugar and/or stabilisers, then the pie will be a bit sweeter but will not set as firmly (though it will still taste delicious). Not suitable to freeze. Chocolate suitable to microwave.